Our offensive performance on Thursday was just that: offensive. It was absolutely disgusting. 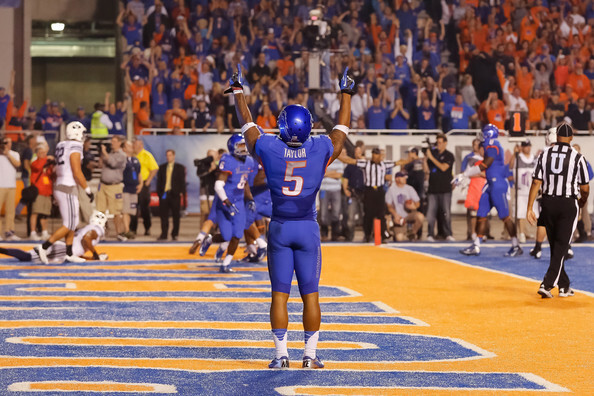 Our defense held Boise State to 0 (that’s Z-E-R-O) offensive points on their home turf, and the Cougar offense still managed to lose the game to Boise. Not only did the offense not execute on the go-ahead 2-point conversion, but they also supplied the Broncos with their 7 points via a pick-6. That makes two games for the Cougars on the blue turf, and two games in which they lost by a single point. Ugh. Here’s a look back at the keys to the game, to see what went wrong (and right) for the Cougars. Offensive Line. There are two plays I’m calling this unit out on. First, probably the best scoring chance the Cougars had that didn’t pan out was near the end of the first quarter. The Broncos failed a 4th down conversion attempt at their own 22 yard line. BYU actually did convert a 4th down conversion en route to the 2 yard line, where the Cougar offense had a 3rd and 1 play. Ryker Matthews committed an illegal block, which set the Cougars back 15 yards, and the next play resulted in an interception. The other play was the Cougars’ final offensive play of the game, the failed 2-point conversion. On that play, offensive lineman Brock Stringham, failed to block his man, which flushed Taysom Hill out of the pocket and deep, which turned what might’ve been a 5 yard run or pass into more like a 15 yard pass attempt, which was tipped and failed. If either of these players had correctly executed their assignments on these plays, the game would have ended in the Cougars’ favor. The Rush Attack. Taysom Hill led all BYU rushers with 72 yards on 12 carries and the Cougars’ lone touchdown. Alisa had 47 yards on 17 carries. And Jamaal Williams you ask? One carry for 6 yards. After several good carried against Utah, I had expected to see more of Williams in this game. And more of Hill for that matter. Special Teams. Not a whole lot to report here. Boise missed a 33 yard field goal attempt in the first quarter. Hoffman had a nice 31 yard kickoff return to start the second half. There weren’t a whole lot of punt returns for the Cougars, as Boise failed to convert on five different 4th down conversion attempts. I will add this: Riley Stephenson is a great punter. Not only are they deep and on target, he is able to make these great kicks even when the defenders are bearing down on him. Turnovers. “BYU must win the turnover battle to win this game. That is all.” Riley Nelson threw 3 interceptions and fumbled the ball once, and Michael Alisa added his own fumble (on the Cougar 1 yard line). Aside from 5 turnovers on downs (not officially counted as turnovers), BYU was unable to account for a single turnover from the Broncos. The one pick-6 in the group was thrown by Nelson in the 3rd quarter, and ended up in the hands of BSU nose-tackle Michael Atkinson. I do not know how, but the 306 pound lineman managed to run all 36 yards to the endzone without being caught. Riley Nelson. The guy is injured. Reports are out that he has three damaged/broken vertebrae in his back. He had convinced coaches that he was ready to play, and they believed him. At least by halftime they should have realized the error and pulled him, but they stubbornly left him in until the third INT, which was the pick-6, and was the difference in the game. Riley finished 4/9 passing for 19 yards and 3 INTS. Yes, he had nearly as many completions to the Broncos as he did to the Cougars. His numbers to the Broncos? 3 completions for 42 yards and a TD. By the time Taysom Hill was brought in, it was too little too late, as the damage had already been done. Bronco D. This is an elite defense. The Cougar defense is ranked 7th overall (that’s by yardage) and 13th in scoring defense. Like I mentioned, they held Boise State to zero offensive points, only 261 yards, and kept them at 0-5 on 4th down conversions. The best series of the game for these guys was the goal line stand when Alisa fumbled the ball on the 1 yard line. The BroncoD held on each of four rushing attempts, regaining possession of the ball in an amazing display of will, skill, and perfect execution. They literally rushed off the field toward Bronco, who greeted them with uncharacteristic jumping, screaming, and yes, even a happy dance. It was amazing to see the coach that energized. The Broncos have the same issues as BYU right now. They have a great defense, and an offense that has yet to truly find itself, except for a spirited outing against Miami (OH) where they netted 39 points. They move on to New Mexico next week, which should give the Bronco’s a nice “open practice” to work on some of their offensive issues. Well here we are at 2-2 again. This should be familiar territory by now, but when we escaped the typical 1-2 start, I had high hopes for something better. In the end, this team is about 3 inches and one tipped pass from being 4-0. That said, we are not 4-0. We’re 2-2, with a defense I’d play against anyone in the country, and an offense that might do well against our November schedule. Riley Nelson should not start another game until he’s healthy. Not, “I can play coach, really!” healthy, but actually, honest to goodness, 100% Riley. If that can’t happen, Taysom Hill should be under center. BYU is hosting Hawaii next week, in what should be a very winnable game…unless the Cougar offense dictates otherwise. Great Assesment!! Thanks for not calling for the HC or OC to be replaced. Thanks. Anyone calling for Bronco or Doman’s job needs to chill. You can be upset with a coach’s decision without calling for his job. Doman’s performance over the past year and a half needs to be scrutinized more closely. He is not getting the job done. Although one game or one decision doesn’t warrant his firing, one and a half seasons of poor decisions do. Thoughts? Thanks for the kudos! To me there are two issues with the run game. 1: the offensive line is not cohesive enough to create consistent running lanes. 2: Jamaal Williams needs more touches.